If you have enjoyed The Lapis Key, please share your thoughts with us. I absolutely loved the book and would definitely recommend this book to everyone. It kept me hooked with my nose in the book! I was always wanting to read more. I couldn’t keep my eyes off the book. P.S. the pictures were out of this world amazing!!!!!! The Lapis Key is a tale of intrigue and adventure, enhanced by the beauty of the natural world and all her inhabitants. It is a book where imagination and creativity run wild, taking the reader on a journey through Fairyland, which is a reality far from the one we have come to know. It is there that butterflies serve as protectors and transporters, bees make magical wine nectars, and chipmunks play games. Any child would delight in the mysticism and spirit of such a place. And there are no better lessons that come from adventure than making strong connections to nature, friendship, teamwork, and believing in oneself, which all await in the magical world of Fairyland. A wonderful book that my son (and I too) loved. He had lots of questions and couldn’t wait to find out about the mystery of this enchanting story. He would not let me put it down!! I am looking forward to the next book. I love the way Elijah begins telling the story of Daisy and Ernie’s thrilling adventures. The Lapis Key Adventures confirms the Author’s profound imagination skills, portrays important life lessons for all ages and includes amusing humor to keep readers entertained. A wonderful story! I look forward to the next adventure & highly recommend The Lapis Key. So start your exciting adventure now! Looks like a great book to read with your kids–lots of details that keeps everyone interested and awaiting the next turn of events. Great first book! 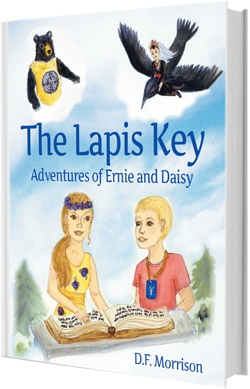 I have been having an awesome time reading THE LAPIS KEY ADVENTURES OF ERNIE AND DAISY with my children. There is adventure, excitement, and fun to keep us all entertained. I have also noticed my eight year old trying to read ahead and guessing the story line while looking at the beautiful illustrations. I am looking forward to the next adventure of Ernie and Daisy. I highly recommend this to families to share together or for elementary students to begin to spark their love of reading. Either way its a gem of a read!